I smell gas in my apartment: The surface of gas range stoves have standing pilots that must be lit. Sometimes these pilots can accidentally go out, which can result in a small gas leakage. First open a window for fresh air and then re-light the pilot or contact us to have our someone relight the pilot for you. Please do not call NationalGrid or Philadelphia Gas Works (PGW) without speaking to someone from SaffRock first. 1. Be sure the surface burner control knobs are in the "OFF" position. 2. Remove the grates and lift up cook top. 3. Locate the pilot ports and light each of them with a match. Replace the cook top and grates. 1. Be sure the oven control knob is in the "OFF" position. 2. Remove the broiler carriage. 3. Hold a lit match at the top forward section of the pilot. No adjustment is required. 4. Replace the broiler carriage. Can I paint my apartment? All of our apartments are painted with Antique White. If you wish to paint your apartment, we ask that you kindly re-paint the apartment Antique White prior to moving out. If vacated apartments are not re-painted in Antique White, tenants will be charged a reasonable fee (dependent upon the color and size of area painted) deducted from the security deposit to cover the cost of extra priming and painting work upon your vacancy. Can I install a satellite dish? No. It is both hazardous and unsightly to have satellite dishes and antennas indiscriminately installed in the common areas of our buildings and/or roof. All of our apartments come equipped with TimeWarner Cable, Verizon or Comcast cable. There was a theft/leak/flood/fire and my personal belongings were ruined: We urge you to obtain apartment renters insurance. SaffRock Investments is not an insurance company and therefore cannot guarantee your personal belongings. For a modest fee, renters insurance will not only provide you with protection for your belongings, but may also cover you in the event of natural disaster, water damage from neighbor, fire, theft, or personal injury. In addition, renters insurance protects you from unexpected damage you may cause to your neighbor's apartment. This is also a requirements of the House Rules. I have cockroaches/mice or other vermin: We have exterminators who visit each of our properties regularly and we take pest control very seriously. In addition, we can set up private appointments, upon request, if further treatment is required. Email contact your property manager to set up an exterminator appointment, please note that if vermin re-appear after treatment we usually have two week window to report to the exterminators. Also, please protect your apartment from pests by not leaving food out on counters & keeping your apartment clean. We aim to make your living accommodations as safe and comfortable as possible. Can I use my fire escape? or hallways, common areas, basements for storage? Fire escapes are to be used for emergency egress only. In addition, storing anything on fire escapes, common areas, basements, attics or in public hallways violates your House Rules which form part of your lease, but also the New York City Housing Maintenance Code and well as the City of Philadelphia Housing Code as well as our insurance coverage. If we find that you are storing items such as bicycles in the hallway or planters on the fire escape, we will have to ask that you kindly remove these items, as they block egress in the event of an emergency. Will you write my next landlord a letter of recommendation? Yes. Pertinent information includes whether you exhibited timely rent payment and courtesy to our staff during the length of your tenancy. We are happy to provide deserving tenants with a letter of recommendation. Please contact Gabriel Saffioti for a letter of reference. I am moving out soon, will you be showing my apartment? Yes. According to the terms of your lease, you are required to provide reasonable access for the Landlord and/or our representatives to show your apartment during the last three months of your tenancy. We work hard to provide you with quality housing, and we greatly appreciate your cooperation in return. 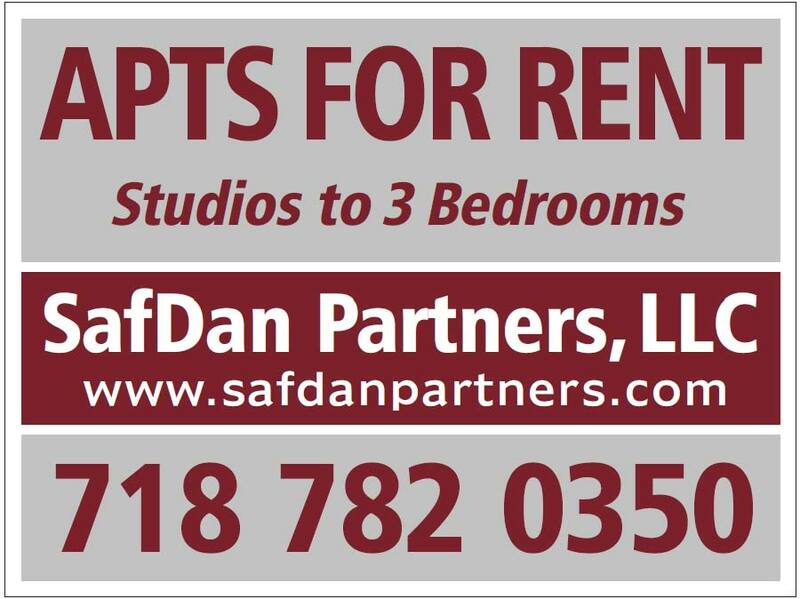 We generally will refrain from showing your apartment until the last sixty days of your lease and, in most cases, renting an apartment will not require more than a few showings. Agree to all terms as outlined in your lease and addendums. You must be current on your rent. Depending upon the amount of time left on your lease, you may want to re-lease your apartment for the remaining term, sublet of the apartment or have the new tenant sign a fresh one-year agreement. If you plan to do the latter, please contact us to get the new yearly rate. Have the new tenant apply through our Application Form found on our website. The application fee is $35 per new applicant in Philadelphia and $50 per new applicant in New York City. Fax or email a most recent bank statement plus proof of income in the form of an employment letter, financial aid statements, tax return or pay stubs; all applications fees may be paid online through Venmo/PayPal to info@safdanpartners.com, please asborb any Paypal fees, as we provide this as a convenience, (if you send the payment as a personal payment owed there should be no fees associated with this transfer). Once your new tenant is approved, he or she will sign a new lease and you will be released of your obligations under the existing lease, unless you have chosen to sublet the space. Your security deposit will be returned from the Landlord approx. 30 days after move-out, not issued from the incoming tenant unless we have agreed to that arrangement and cleared any outstanding fees you may owe us, this protects the incoming and outgoing tenant (minus any reasonable deductions for late charges, apartment damage, gas bills, water usage charges etc).